Some called him the reluctant heir. But Rahul Gandhi, who has been taking the Narendra Modi government on with uncharacteristic vigour in recent weeks, may finally have emerged out of the shadows of his mother, Sonia Gandhi. The 47-year-old scion of the Nehru-Gandhi family was on Monday elected president of the Congress party. The only candidate in the fray, he will formally take over the reins of the 132-year-old party from his mother on December 16. For Gandhi, the challenge is enormous. The Congress has been struggling to grab political space, and the Amethi MP has to steer the party at a time when the Bharatiya Janata Party has been gaining ground, and states. The Congress party's 16th president since independence -- the fifth from the Nehru-Gandhi family to hold the post after 1947 -- was ushered into politics when he won the Amethi Lok Sabha seat in 2004. The party made him its general secretary in 2007 and vice-president in 2013. His initial years as vice-president were difficult ones -- Rahul was criticised for practising politics of fits and starts -- and of taking long breaks even in critical times. But while politics may or may not have been his calling, it was certainly in his blood. 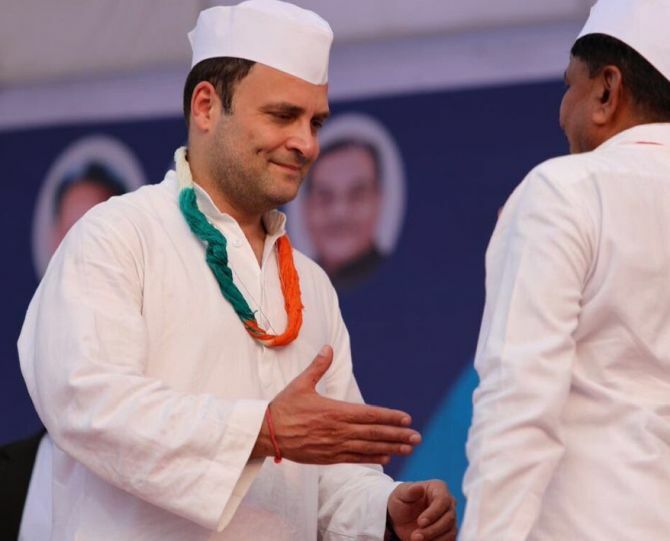 Starting from his great-great grandfather Motilal Nehru, the party has been tightly held by his ancestors, including great-grandfather Jawaharlal Nehru, grandmother Indira Gandhi, father Rajiv Gandhi and mother Sonia Gandhi, who steered the party for a record 19 years. His easy elevation is also unsurprising, given the tacit understanding that the mantle must pass from Gandhi to Gandhi. In the initial years, it seemed Rahul -- who had seen the assassination of his grandmother and father -- wanted to steer clear of the murky world of politics. Gandhi, who went to St Stephen's College in Delhi and then to Harvard and Rollins College in Florida and Trinity College, Cambridge, joined the Monitor Group, a consulting group in London, where he worked for three years. But after than it had to be back home, to the political role carved out for him. Gandhi's electoral record has been dismal. Since he became Congress vice-president in 2013, the party has lost power in state after state and is left with only five. But Congress leaders hope he would draw the party out of the quagmire it has been pulled in, and onward to success. "I am sure the party will see not just a revival but massive growth under your able and dynamic leadership," Punjab chief minister Amarinder Singh said to him on Monday. Top Congress leaders say his leadership will be established if he delivers a victory in Gujarat or at least substantially improves the Congress tally there. In the last few months, Gandhi has been looking confident, having worked on his image and outreach. Now no longer as reluctant as he seemed in his early years, he looks relaxed and confident, targets PM Modi with his one-liners, uses popular cultural idioms effectively and has significantly improved his social media following. Besides, Gandhi is now talking about his Hindu credentials and without being defensive about his faith. "I am a Lord Shiva worshipper," he said a while ago to counter the BJP's attempts to appropriate the Hindu religion. He is also getting vocal about his private life. "I believe in destiny," he said when asked at a gathering why he was not married. Recently, he said he was a black belt in Japanese martial art form Aikido, and talked fondly about his pet dog, Piddi. Armed with a refurbished social media team, Gandhi is also trying to appear more accessible to the public. Congressmen refer to his address to students in Berkley, United States, when he boldly took questions, even on dynastic politics, to underline his new-found confidence. Gandhi's US trip, crafted by his father's friend Sam Pitroda, was seen as hugely successful and one that cast the Gandhi scion in a fresh and new political mould. The BJP has started taking Gandhi seriously of late, often fielding a host of ministers to counter the Congress charge against demonetisation and GST. Earlier, too, Gandhi's jibes against the government such as "Suit boot ki Sarkar" and "Gabbar Singh Tax" had put the saffron party on the defensive. Gandhi has now started posing a question every day to Modi, quizzing him on a wide range of subjects. But can Gandhi handle the rough and tumble of 24X7 Indian politics with aggressive rivals such as Modi and BJP President Amit Shah to counter? Senior Congress leader and former minister Kishore Chandra Deo was confident he would galvanise the party. "The Congress has a presence and outreach all across the country. Rahul will have to revive the party and shake it up. He needs to pick up the correct people for the correct places and regions," he said. If he can do well in Gujarat, Deo said, he can do so in any other state. All eyes are on Gandhi -- and December 18, when the results of the Gujarat and Himachal Pradesh Assembly elections would be announced.